My set up is pretty simple to do with great products. All my hunting cloths is washed in Buck Stop laundry soap, I shower with Buck Stop full body wash. And when I get to my hunting location I use Buck Stop dirt human scent elimator. On site I will use or make a mock scrape using 200 Proof and I also put some on my boots. This year 200 Proof worked like a charm. Wind was blowing from East to West. This buck came in trotting with his nose in the air. I ended his life with a 12 yard shot. Its a 8 point with a 18 inch inside spread and dressed out at 190 pounds. Buck Stop made it happen. Thanks a million times over!!! 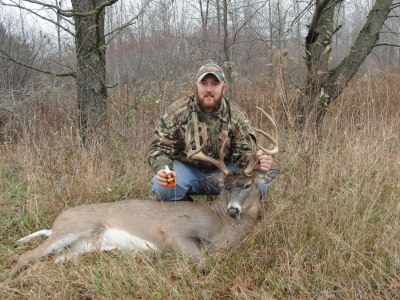 It is offical Pro-Staff member Eric Christensen's Michigan buck scored 143 5/8. Taken in Montcalm county. Eric credits the use of scents and calls, as well as being in the right place at the right time as keys to his success. This buck was camera shy. Buck Stop owner Brian Johansen had 3 trail cams set out on the property, not one photo of this buck. It is interesting to note that the buck was taken with in 30 yards of a mock-scrape that had been freshed up the day before with Buck Stops New HYPER synthetic scrape formula. Buck Stop Pro-Staffer Eric C tags big 10pt with 200 Proof. Eric has a passion for hunting big bucks. Last year he bagged a large 8pt that had responded to a call and Buck Stops 200 Proof Doe-In-Heat. Well this year is a repeat of last year. While hunting Buck Stops property Eric rattled and bleated with a Quaker Boy Bleat-in-Heat can call. Shortly after wards he heard a crash a fence line. The big boy had come a courting. The buck marched across a hay field coming downwind of his stand. At about 80 yards the buck detected the 200 Proof Doe-In-Heat smell. The buck stood smelling the wind current trying to figure where the doe was located. Starting to lose interest the buck put his head down and started to walk. Being desperate Eric used the bleat can once more, upon hearing the estrus bleat the buck whirled and headed right to Eric. At 25 yards the buck gave Eric a good shot. The rest is history. NOTE: This is the second trophy buck Eric has taken out of Buck Stops owner Brian Johansen's stands. 2 years, 2 buck, with 200 Proof. Just wanted to send you a few pictures of my buck with the guide series doe-in -heat it worked awesome! I had a trail with 9 scrapes along it, on the way to the stand I put some of that scent in the scrapes and when this buck hit the trail with the scrapes his nose hit the ground and he checked everyone one and worked himself right into bow range with the help of a grunt and it was over! 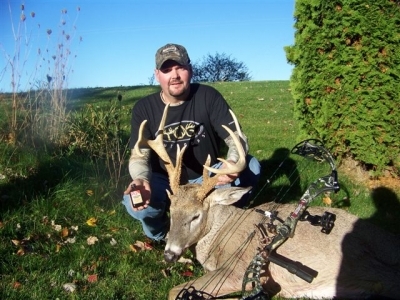 Great product that helped TOG Outdoors put a 136 2\8 Michigan buck on the ground! the scent elimantor is working out awesome also! Thanks for everything. 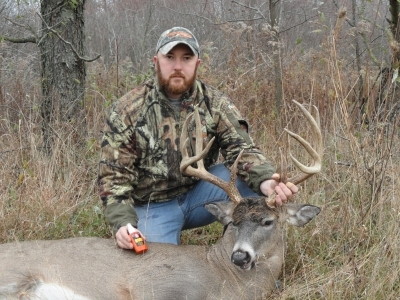 Buck Stop owner Brian Johansen scores on a 8 pt that responded to scents and rattling antlers. Here is the story. Being a business owner of a company that produces deer hunting scents and lures you would think I would have lots of time for hunting. Wrong. This is a really busy time of the year, so my hunting time is at a premium. Oct 13th I finally found time to slip out for a morning hunt. Before daylight I had a buck grunting and chasing a doe through the corn field and woods beside my home. I never saw him due to the early hour and lack of daylight. It was a great morning to be in the woods. I had to hurry to get to work, all day at work I kept thinking about the buck chasing that doe. The weather turned bad before noon with heavy rain and wind. The leaves were dropping like crazy with the wind. I kind of had a plan laid out for a evening hunt, I figured that the bucks would really be running their scrape line to remove the leaves and re-mark the scrapes after the rain. I had some small items to take care of after work so I was not able to head out to the stand until 5pm. The wind was perfect for one of my favorite stands that I have not hunted in 2 years. I jumped 2 doe's while walking in to the stand. My stand is located in a 3 way corner of a fence line with a corn field on west side, a freshly planted winter wheat field on the north side of the stand and an over grown fallow field with rows of 15 year old pines planted in bands across the field to the east of the stand. I have a road mowed around the fallow field for easy access. After spooking the doe's on the way to the stand I was thinking oh great. The doe's ran in to the corn but did not snort which was a plus. I was surprise by the large number of scrapes and rubs that have appeared during the last month just about every overhang branch over the road had a scrape under it. 20 yards from my stand there were 2 nice size scrapes and a pretty nice rub. Good sign. Now after not hunting this stand in 2 years it needed brushing out, as quite as I could I opened up a couple of my shooting lanes, finishing up I place a scent wick near the rub treated with Buck Stop's New Guide Grade Scents Doe-In-Heat. I reapplied some Buck Stop DIRT masking scent on my boots. Climbing in to the stand I had some limbs to remove there as well. Now it 5:30pm I am settled in starting to enjoy the fall colors, geese flying, just a great night to be hunting. At 6:30 I started a rattling sequence with a light sparring rattle. This lasted about 3 minutes, with in just minutes a doe and fawn came troting out of the corn field. COOL! They milled about a short while and headed out in the fallow field to feed. About this time the wind started to pick up and it was totally wrong for this stand. Bummer, figuring the hunt was going to be a bust with the wind coming out of the north. During a lull in the wind I picked up the antlers and rattled again this was a little longer this time, about the time I was thinking about hanging the antlers up I heard a corn stalk break, looking behind me I saw a nice buck walking toward me. I hurried and hung the antlers up in the tree, I grabbing for my bow with my heart just pounding in my chest. Love that feeling. The bucks course was taking him downwind of me. He passes through the fence line 30 yards downwind of me but intently looking for the 2 bucks that he heard fighting. He contiues to circle me until he is directly down wind of the rub where I had placed the Doe-In-Heat scent. It was like he ran in to an invisiable wall, he stopped and started doing the lip curl smelling the scent. Walking forward to smell the scent wick, He gave me a good shot. The rest is history. I have know for years that the best time to use "Estrus" type scents is the 2 weeks or so before the actual breeding phase of the rut kicks in. At this time the scent you put out is the only source of the scent a buck is seeking. Buck Stop Lure Co, President Brian Johansen along with TOG Marketing Director Curtis Cook had a successful bear hunting trip hosted by Artic Edge Outfitters in Ontario Canada. The weather was unseasonably hot with temperatures in the high 90's. Brian and Curtis were planning to film the hunt for a future TOG TV show. Getting a successful hunt on film is a lot harder than hunting by yourself, twice the nosie, twice the scent, twice the movement. The weather was holding the bear movement to the cooler parts of the day. 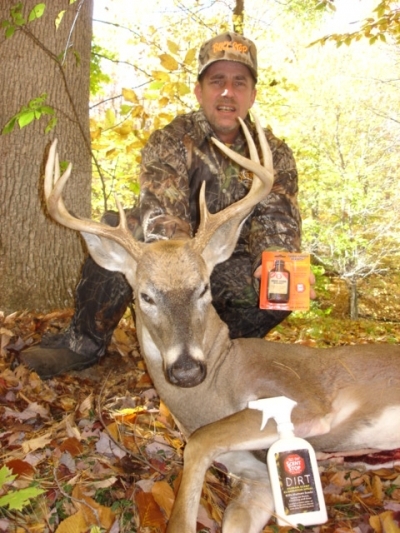 Brian and Curtis relied on Scent Stop, scent eliminator products from Buck Stop to kill the human scent. The walk to the stand would soak you in sweat, with out a scent eliminator we would be busted. On the 2 day of our hunt this bear came in from downwind and never knew we we there. 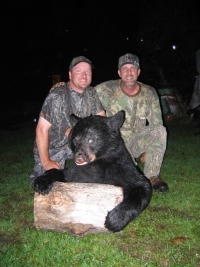 Congratulations to Curtis on his first black bear. OH and we got the whole hunt on film. 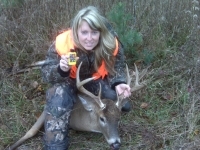 Pro-staffer Kelly Wilson is a long time Buck Stop user. I started using Buck Stop on my very first hunt back in 2000. My dad use to take me out hunting with him when I was little and he always used Buck Stop, he always seemed to get a buck. One one of our hunts I saw first hand how effective scents work. My dad had doctored up a mock-scrape with some Buck Stop Ruck'n Buck buck urine on the edge of a woodline that we were hunting. The sun was just starting to light up the sky when dad issued a couple buck qrunts from his call. With in minutes a nice buck pops out of some planted pines. The Buck was about a hundred yards downwind of the mock-scrape. After sniffing the air for several minutes the buck turned directly in to the wind and walked right to the scrape and put on quite a show of tearing in up. Dad told me that the buck was trying to remove the scent he had put out. Since that day I have used many differant Buck Stop scents with great success. I still use the mock-scrape system combine with rattling and grunting. This is one of my bucks that Buck Stop has fooled. 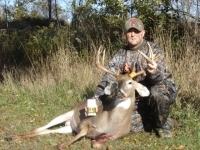 Pro-Staffer Eric C had a successful hunt in Oct 2009. On Oct 12th I had a busy schedule with not much time for a morning hunt before I had to be at work, I would only have 2 hours at the most. My normal hunting area is a 30 min drive from my house which would not leave anytime for a hunt, as I would have to leave the stand during prime time possibility scaring bucks out of the area, not wanting to wreck the area I had to come up with plan "B" or not go hunting. I called my future father in-law to see it I could hunt out behind his house, he has 40 acres 5 minutes from my house. The property had not been hunted yet this year, as he had torn his ACL, walking and climbing trees was out of the question. Luckily Brian said I could hunt there, he even suggested which stand to hunt in. Up on reaching the property in the darkness I was unsure of which trial to take to find the stand as I had never been to that stand before. I remembered a stand that I had saw during last years rifle hunt. Heading to find the stand in darkness I knew I was close, but what tree was it in. I had to break out the flashlight and start shining it up in the trees to find the stand, all the while thinking great I am going to spook any buck away with the light. Finding the stand I back tracked to the field edge and made a mock-scrape under a oak limb 20 yards from the stand. I placed a good squirt of Buck Stops 200 Proof in the scrape and dribbled a few drops on the overhanging branch. By now it is starting to get light, I hurried to get up in the stand. After getting settled in I reapplied Scent Stop scent eliminator on my clothes, while putting the spray away I felt my bleat can. Thinking what the heck I bleated a couple times. About 80 yards away I saw a flash of antlers in the tall grass. Grabbing my bow I got ready, 20 minutes later after not seeing any movement and fully light now. Where did he go? Grabbing my grunt call I softly issue a couple grunts. I see him and another buck coming from directly downwind of me at about 75 yards. Oh NO buck fever is setting in. As if he was tied to a string, along with the smaller 8 point they came right to the mock-scrape. As he was smelling the scrape he gave me the perfect shot. The rest is history. With out a doubt the Buck Stop 200 Proof along with the calls made this hunt a success. By the way I made it to work with 15 minutes to spare.